2018 hasn’t just been a golden year for fighting games - with everything from Blade Strangers to the upcoming Super Smash Bros. Ultimate laying the smacketh down on consoles - it’s also been a cracker for anime adaptations making themselves welcome on Nintendo Switch. So what happens when these two potent streams collide? Well, the answer is likely to look a lot like My Hero One’s Justice. 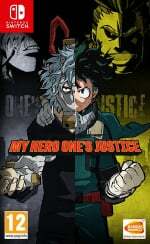 Based on the brilliant My Hero Academia series (which is based on a manga, as all things are from Japan), this over-the-top fighter certainly has all the theatrics and explosive battles befitting an anime all about a young boy with no powers who’s born into a world where being ‘super’ is considered the norm. 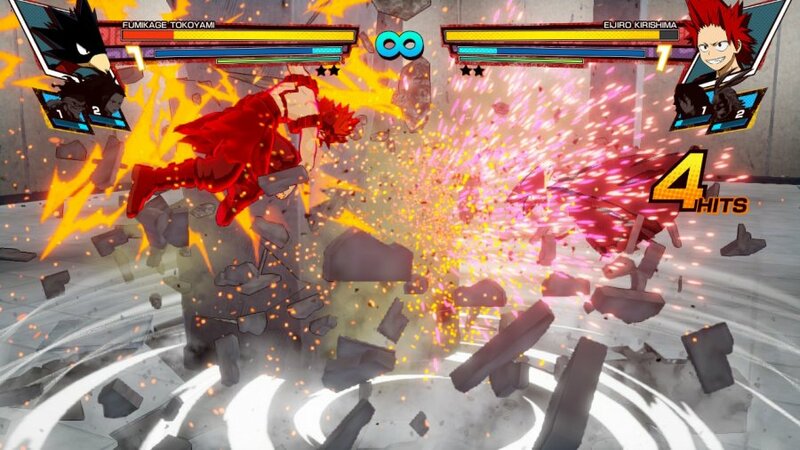 At first glance, it plays a lot like other free-form fighting games such as Power Stone or Dragon Ball Xenoverse 2, taking away the traditional fixed plane and enabling you to run around an arena unleashing both ranged and up-close attacks on your opponent. 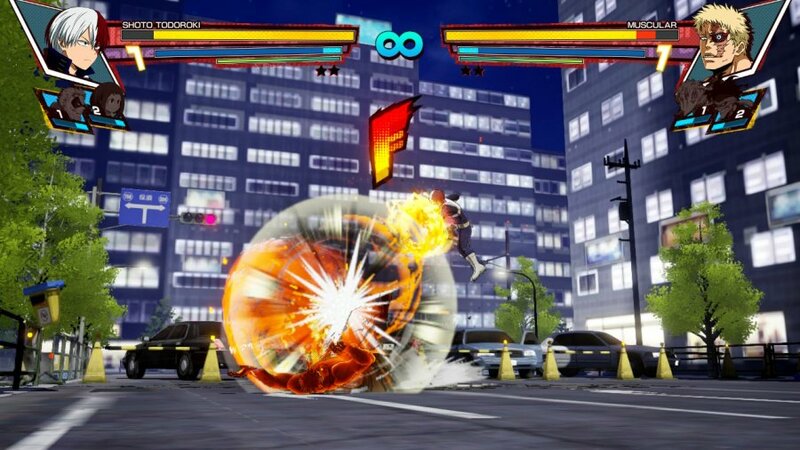 Whether you’re a fan of the source material or just someone in the market for a new way to battle at home or on the go, My Hero One's Justice makes quite the first impression. 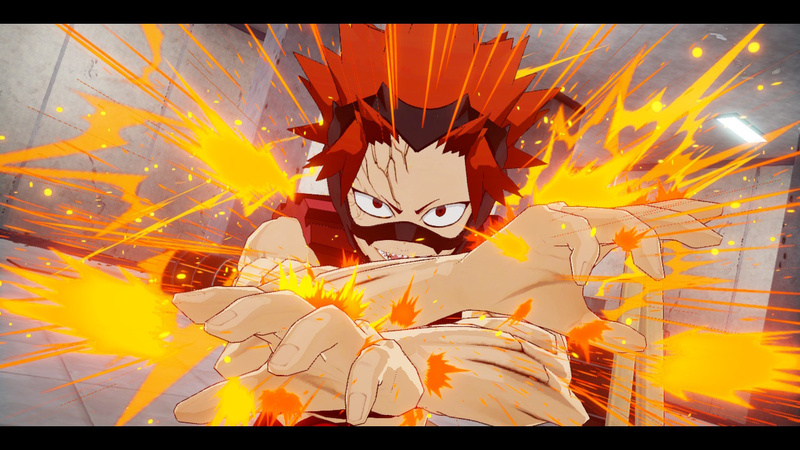 Each character in the 20-strong roster has their own unique power (or ‘Quirk’ as they’re known in the anime’s parlance) which range from Kirishima’s armour-up buff or Todoroki’s powerful ability to fling fire and ice from afar. There’s a nice balance to how these abilities work against one another, and each one is perfectly suited to the character they’re linked to. The main portion of this 3D fighter’s combat model is based around three kinds of attack that are bound together in a rock-paper-scissors style setup. Unblockable attacks can break through counters, normal attacks can undo unblockables and counter-attacks are the bane of normal attacks. The key is learning to preempt your opponent’s attack with one of your own, but even if you mess up, there’s always plenty of room to regroup and potentially turn the tide of a battle with an unexpected Quirk. Every arena has destructible elements, and there’s a real thrill to throwing your opponent into a concrete pillar only to rush them and send your poor foe crashing straight through it. If developer Byking was aiming to capture the intensity of two super-heroes throwing down with the machismo theatrics of the My Hero Academia series, then it has done itself proud. But once you’ve played a few rounds of this super-powered fighter, you’ll soon discover there really isn’t much nuance to be found beyond the bravado of its exterior. The developer has clearly aimed to build something that’s accessible first and foremost, offering up a loud and lively arcade brawler that wouldn’t look out of place in a bulky cabinet stuck to a sticky carpet in a smokey amusement arcade of yore. By that token, practically anyone could pick this title up and be laying waste to their opponents and the environment in no time, but there’s very little depth to the game’s core mechanics. There’s plenty of room for outlandish creativity as you mix up your counters and Quirks, but it’s unlikely to appeal much to fight fans looking for BlazBlue levels of mechanical nuance. Even Dragon Ball FighterZ - which also opts for instant accessibility over dazzling complexity - is deeper than this. You do get plenty of modes for your buck, however. Arcade sees you in a six-tiered series of battles, while Missions offers a similar setup only with special requirements that spice up each encounter. You can also play cooperatively with a friend in Local mode, or head online for some distant fights thanks to decent netcode. However, if you’re a My Hero Academia fan in the West it’s the Story mode you’ll be hoping to sink your teeth into. Covering the anime’s sixth story arc, My Hero One's Justice doesn’t exactly pick the most natural of places to bring the series to a fighting game format. So many important story beats and key character developments during season two and three are seemingly dropped or placed out of sequence. It doesn’t help that the game doesn’t feature voice-overs from the western dub of the show, so you’ll have to stick to Japanese VO and English subtitles. If you’re new to My Hero Academia and you were hoping for a way into this world of superheroes and schooling, this really isn’t the best place to start. While My Hero One’s Justice certainly looks the part - with all the crash, bang and wallop you’d expect from a game based on such an outlandish anime - it proves to be more style over substance. If the likes of Blade Strangers and SNK Heroines: Tag Team Frenzy have got you in the mood for easy-to-pick-up fighters, this title will easily fit that mould, but for everyone else, it’s a disappointing use of a franchise brimming with quirky (no pun intended) potential. Turning My Hero Academia into just another brawler in a way sums up my issue with the anime. The anime to me just feels like a big "action school anime" of which there have been dozens of over the years. Academia does what it does right, very right. It has creative abilities, fun characters, and great action, but what it does wrong, it does very wrong. Rarely if ever do the character seem remotely Heroic - this is despite them spouting off about become heroes almost constantly. Everything has a "me me me" feel about it. That said, the good still outweighs the bad, the action and animation and most abilities are really cool. To be fair, the end of the most recent season suggested the show would be getting more serious too. Back to the game. Anime games have a history of doing this. It's the easiest and laziest way to turn an anime into a game. "Look at this anime with characters who can fight! Welp, no more thinking, let's just make yet another fighting game!" Done. Naruto did it, Bleach did it. One Piece did it. Pretty sure SAO did it, but more recent SAO games have thankfully branched out. Most anime that get enough popularity get a mediocre fighting game. Personally I'd love a school RPG ala Persona, where we could be our own character with a quirk all our own, we'd have to plan out our time between physical training, quirk training, regular studies, classes, an social life. So much of the anime is only about the fights, I want to see what these hero classes are like, and what they do after school. @bluemujika See! That would be an awesome idea for a My Hero game! Why do writers here always says no pun intended when they definitely meant the pun? @Heavyarms55 don't forget the nanatsu no taizai and black clover games that just came out this year. And yeah, a lot of the games are mediocre, but there are some games that just feels way better solely because of the source material. For example, one piece pirate warriors, is on of the best games i've played, Nd most of the fun came from the use of the characters right, despite the core game being somewhat repetitive. @Zoroflamingo It's to highlight the 'Pun', no pun intended. @Heavyarms55 completely agree. I feel the game needs more depth than just fighting. I think the game could have done a better job of explaining the story up until season two (where the game's story mode starts off at). This might be the introduction to the My Hero Academia series for a lot of gamers, so it might be awkward jumping into Deku's story at the halfway point for the uninitiated. How in sweet hell did this score LESS than SNK Heroines? This has nearly twice the number of fighters, free DLC, more modes and (compared to SNK Boobies) way more complex graphics and gameplay. What's the frame rate? Based on videos on YouTube that run at 60 fps it looks like it hits 60 but rarely stays there. If so, it just doesn't compare graphically to other fighters on Switch. I think every fighter I own on Switch is basically locked at 60, which is awesome and necessary because of the speed of interactions in fighting games. The Powerstone comparison makes me curious about this game. The Powerstone games are some fun games! @bluemujika @Heavyarms55 As tempting ideas like these may sound, they're just not feasible. First of all, creating a balanced framework for players to customize their characters within in accordance with the in-universe rules is impossible for series with robust abilitiy systems (JoJo, One Piece, HxH, BnHA etc. ), that have not been finished yet to boot. Secondly, it would require a lot of attention from the original creator, who is already busy enough with his actual work on the manga, without having to come up with ideas for activities not shown in the series itself that could be translated into a video game. Stories about characters with very limited skill sets, like Dragon Ball or Shingeki or Kyojin, are relatively easy to adapt with option for players to make their own creations, but for everything else the line has to be drawn somewhere, although I admit that developers too often choose the easier route when there's still some extra room to spare. @bluemujika I know nothing about this show but I would totally buy a game like that! Is this a fighter only game or does it have o world and a story (like Naruto ultimate series)? I was gonna get this game but the sheer paper thin qualities of the combat and the fact that a handful of characters seem to be overpowered, and with a lackluster story. The Ultimate Ninja Storm Trilogy is just a better buy overall. The lack of an English dub for this game also upsets me, because a dubbing team already exists for MHA. And not being able to understand what they say during fights was the straw that broke the camel's back. I like this a lot more than SNK Heroines, which to me, was the real fighting game disappointment this year. I was really excited for that game and it just turned out to be not that good. But this one, I actually really enjoyed... right off the bat. I'd give it a 7 at least, just from my early impressions, with the potential to maybe be an 8 once I play more. @Preposterous They could always come up with a few pre-made abilities and let you customize your character's appearance. I'm actually having lots of fun with this game! For some reason it takes me back to the first time I played Rival Schools. Not all anime are based on manga. Many are based on light novels, some on video games (like the long-running Pokémon anime), and while rare a few are even original series. I couldn’t disagree more with this review. This is one of the fighting games, maybe even THE fighting game, I’m enjoying the most this year. I love pretty much everything about this game. The battles are fast and furious. The reviewer is of the opinion that an approachable and easy to learn fighting game is a bad thing. Well, to me it is not. Fighting games are among my favorite games but sometimes the learning curve is just so steep that takes away all the enjoyment from the game. This game doesn’t have that problem. It’s not a technical fighter like BlazBlue but that’s actually a very good thing. This game is a solid 8 in my opinion. According to Metacritic NL is scoring this lower than anyone else. The fact that the same reviewer gave SNK Heroines a higher score suggests that this review is doing little more than dragging down the average. It has its faults; long loading times, annoying camera angles, lack of decent tutorial, too many static cutscenes, but it's way better than a 6/10. You get a fair bit for your money and the day 1 update provided free DLC and an arcade mode. Wow. I'm not sure what I'd give it, but it'd be higher than a 6/10.